the Infanta Margarita at the centre of Las Meninas). the generation of his most sublime images. information can be meaningfully contextualized. intrinsic to the practice of technical Art History. Velázquez,” in Velázquez y Sevilla, ed. Alfredo J.
Francisco Pacheco, El arte de la pintura (1649), ed. Bonaventura Bassegoda y Hugas (Madrid: Cátedra, 1990). 1960), II, pp. 215-216, doc. 8.
in Velázquez in Seville, ed. Michael Clarke, exh. cat. cultura y el arte en Sevilla, 2015), pp. 94-263.
and Variants,” in Titian, ed. David Jaffé, exh. cat. Magazine 160 (2018): pp. 454-461.
cuadratura del círculo,” among others. se parece mucho a su dueño en los perfiles,” pp. 439-440. Meadows Museum, 2012), pp. 17-35, see p. 28, fig. 7. Barroco (Barcelona: Editorial Ariel, 1975). Pennsylvania Press, 2012), pp. 49-76. García Máiquez, “La cuadratura del círculo”. Life,” Metropolitan Museum Journal 40 (2005): pp. 79-91. 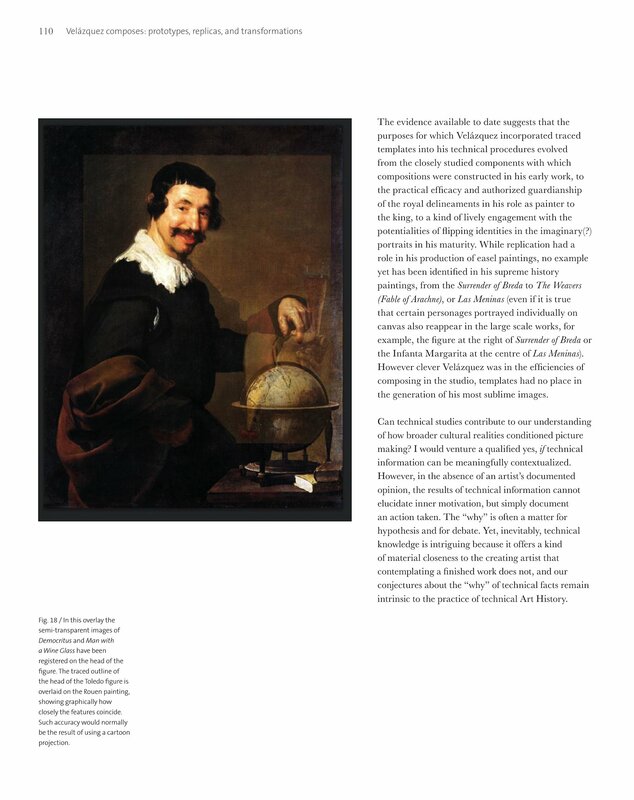 McKim-Smith, “Velazquez: Painting from Life”. available on-line, accessed July 2018, https://www. See Tiffany, Diego Velázquez’s Early Paintings. Pacheco, El arte, pp. 452. Artes de Sevilla, 2016), pp. 13-24 and pp. 25-36. Until recently the two paintings were dated ca. 1638. Wallace Collection) as ca. 1640. Lady with a Fan (Wallace Collection) as ca. 1640. Maravall, Culture of the Baroque, p. 179. Reconsidered,” The Art Bulletin 86 (2004): pp. 75-95. Maravall, Culture of the Baroque, pp. 199-200. Kientz, Velázquez, no. 56, p. 216. Pacheco, El arte, “of many things a pleasing whole”. Salamanca y Alcalá, y de otras personas doctas. Magdalene, and a Diana into Saint Mary of Egypt).